It seems like all the really good comfort food casseroles call for a can of condensed, cream-of-some-kind-of soup. Chicken noodle casserole, broccoli cheese casserole, tuna casserole, green bean casserole, and many more. There was a time when I would just skip over these recipes, thinking that if I wanted to avoid the canned soups, I’d have to avoid the casseroles too. And then I realized how easy it is to make your own condensed, cream of ANYTHING soup! Seriously, why would you grab a can that’s full of lots of things you probably don’t want to be eating and contain way more salt than you need, when making your own is just as easy as making gravy? It takes just minutes to make, and you can adapt the same recipe to suit whichever creamy soup base you need. Sure, having cans on hand is easier than making soup whenever you need some, but the nice thing about this recipe is that you can freeze it in can-sized portions (about 1 ½ cups), so that you have exactly how much you need, whenever the craving strikes. The recipe I use for homemade condensed soup creates a nice, thick soup that you can use just like the canned condensed soups. To reconstitute the soup, warm it with 1 ½ cups of liquid (broth, milk, or water). If you want a thicker soup, simply use less liquid. And honestly, many recipes that I use this soup for even tell you how much other liquid to use to get the soup to the right consistency for the dish. If you have frozen the soup, simply thaw it in the refrigerator for 24 hours before using it in your recipe. Then it should be ready to go! We’ll make condensed cream of mushroom soup as our base recipe, and below you will find ways to adapt this recipe to the other condensed soups you may need. In a large skillet with high sides, melt the butter over medium heat. Add the onions and sauté for 2-3 min. Add the mushrooms and garlic, sauté for 2-3 min. Add the flour and cook for 1 minute, stirring until moistened. Mix in the milk and broth until the soup has a smooth consistency. Bring the mixture to just barely simmering. Reduce the heat to medium low and continue to barely simmer for 8-10 minutes, stirring often, until the soup is nice and thick. Use your condensed soup immediately, or let it cool completely and transfer it to a jar or freezer-safe container. Store the condensed soup for 3-4 days in fridge or freeze for 2-3 months. 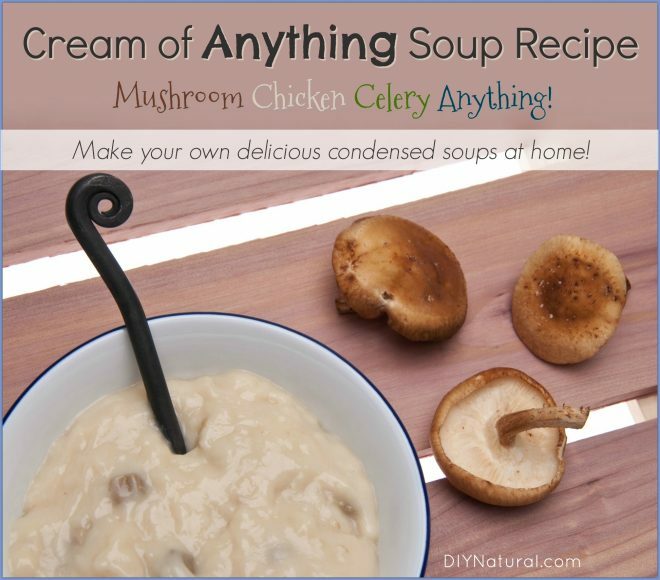 For condensed cream of celery soup, substitute 1 cup of finely chopped celery for the mushrooms in the recipe above. For condensed cream of chicken soup, omit the mushroom completely from the recipe above and use chicken broth in place of vegetable stock. If you really want to amp up the chicken flavor, try mixing in 1 cup of finely chopped, cooked chicken. You won’t find that in any can of cream soup! 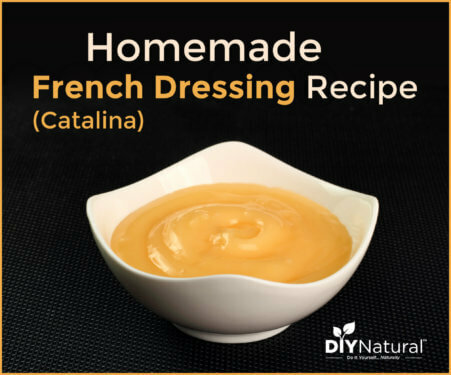 Do you have your own condensed cream of soup recipe for casseroles and other cooking? Which one is your favorite to use? Hi Janie. Honestly, I’m not sure what the proper protocol is for canning something that is milk-based. I would personally stick to freezing, but maybe another member of our community can speak to this for you. How long can this be frozen? I love the idea. Hi Suzanne, We have kept the soup for 2-3 months in our freezer, and it still works great. Enjoy! I actually have a cream soup mix that you just add water/broth to and that’s it. you can add mushrooms, spices, chicken, potatoes,whatever. It mixes cornstarch, non-fat/non-instant milk powder and powdered bouillon ( i use a low sodium version). No need for freezer space or thawing! Sounds like a great dry mix Karen! Thanks for sharing! This sounds like a really good soup. You say that it can be frozen. Instead of freezing can I “can” it? That way it would keep longer, I think. Hi Jeanette. Honestly, I’m not sure what the proper protocol is for canning something that is milk-based. Maybe another member of our community can speak to this for you. Thank you for these recipes. I can’t wait to try them. Thanks Kristine! I hope you enjoy using the soup! Wonderful! I can’t wait to try this! Thank you! 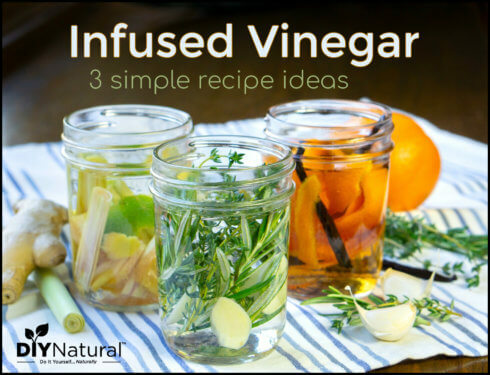 Since I try to not use commercial canned stuff (cause I don’t want their preservatives) I love ideas and recipes like this.. Keep up the good work! I am a little confused since you said your final product on our pan was CONDENSED soup. Do you need to add more milk to it to serve as soup then? I’m sure that’s it. 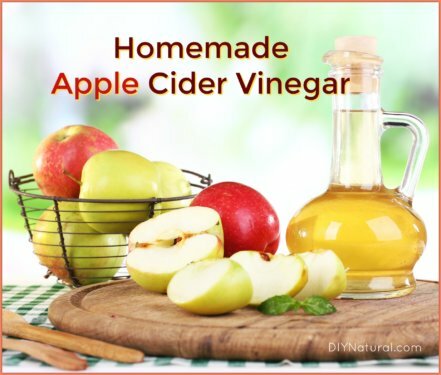 It is condensed- add 1-1/2 cups liquid for soup. I have made my own for years for Green Bean casserole. You can sub organic cornstarch or arrowroot powder for the flour for gluten-free soup. The conversion is usually on the package. You are correct Dee. Like Veronica mentioned, right before the recipe I talk about how I typically reconstitute it. Enjoy!